I’m sure that you’ve either heard people raving about his catches at the Senior Bowl or the fact that he’s the NCAA’s all time leader in receptions. Don’t be impressed by those things; the catches are a very small sample size and his reception totals are tremendously padded by screen after screen. Instead, get excited about his speed and his ability to get off the line. He can get by a corner who creeps in for a huge play over the top, but when the DB respects him enough to play soft, Jones reads that too. He’s more effective in the slot, but has the combination of hands, height and speed to do damage outside too. Jones reads zones well, either finding a seam with an over route or sitting down in the gaps. He has double moves in his repertoire, as well as the ability to adjust to the ball’s flight and get physical. Even when he’s not making a catch, he fights to break up poorly thrown balls. This sounds glowing, especially for a small school guy who probably won’t crack the top five receivers on most draft boards, because it is. 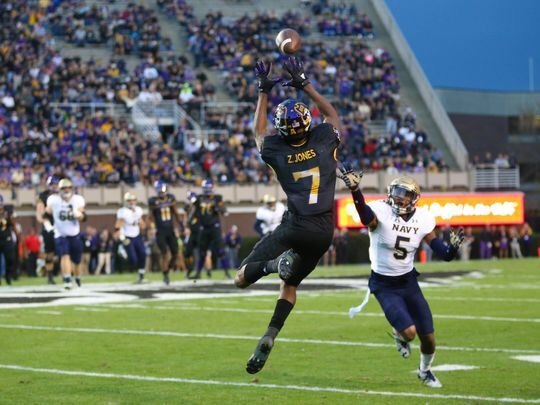 Zay Jones has his warts; he’s better suited to the play either flanker or slot rather than the X position, his route tree has been stunted by how often he’s deployed on screens, and he doesn’t give you much in terms of a red zone threat. In spite of that, he’s a riser on my board.